AWS workflow for Alfred 3. This workflow allows you to search EC2 instances by InstanceId and by the Name tag. 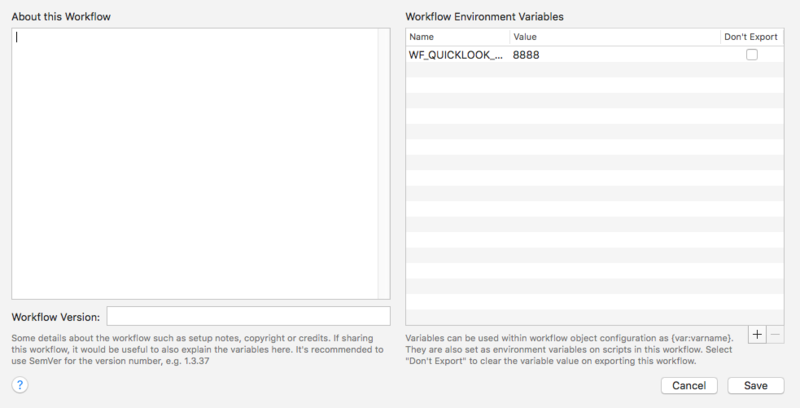 In Alfred Preferences, choose the AWS workflow and click the [x] icon to configure the WF_QUICKLOOK_PORT environment variable. If not configured, quicklook will be disabled. Select an instance to copy the private IP address to your clipboard. Hold alt to copy public IP address to your clipboard. Hold cmd to open AWS web console to that instance. Search queries can be in the form of a space separated list of facet:value or simply just value. Single (') or double (") quotes may be used for either the facet or value to allow for spaces, and escapes (\\) can be used to escape a literal apostrophe or quotation character. Furthermore, colons in facets and values can be specified by quoting the string (e.g. : url:'www.august8.net:8080'). The available facets for each service, as well as the default facet if not provided, is specified for each service below. If a bare value starts with i-, the workflow will search for exact prefix matches against the EC2 Instance Id. Otherwise, bare value queries will search the Name tag for the instance. All other facets map to the tags on the instance. Note, all tag names are converted to lowercase. The default facet is the Name tag for the bucket. All other facets map to the tags on the bucket. Note, all tag names are converted to lowercase.